While I love implementing Scrum in Team System, nothing can quite compare to a physical story wall of sprint task board. The intimacy and tactile nature of moving cards around on the board cannot be replaced. However, a good many of my clients who are implementing Scrum shy away from using note cards and sticky notes. Conchango provides a very cool WPF app that simulates a sprint task board, but even when you have it projected on a large screen, someone still has to sit at the computer to move items around and it is either a logistical nightmare having each person sit down to do this or one person does it while everyone tells them what they did and you start to loose the attributes that make the task board such a great tool. You could go out and buy a large touch screen monitor and mount it in the Daily Scrum room if you have $3000 to $5000 just lying around. Or you could buy an interactive "smart" white board for about the same cost. If your company is that much invested in Scrum that they will approve such an expense, please let me send you my resume! The rest of us do not have that kind of money to spend and I was very intrigued when someone sent me this link to a YouTube video featuring an interactive story wall using Mingle. Upon further investigation this setup can be easily achieved with less that $100. The first laptop I tried this on was a Sony Viao and it came with the standard Windows XP Bluetooth stack which while it will see the Wii Remote it does not really know what to do with it even once it have been connected. I had to download the stack from Bluesoleil to get it the connect and be recognized by the Wiimote Whiteboard Software. The download is only a trial and the purchase the product it was $30 USD. 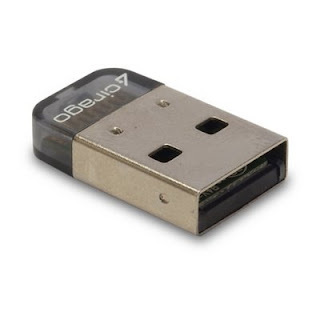 My work laptop did not have Bluetooth so I just decided to buy a Bluetooth receiver so I could then setup everything up on any computer with a USB port. 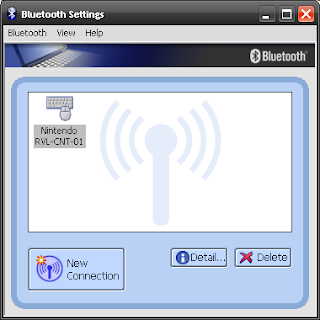 The website WiiBrew has a list of Bluetooth drivers and receivers that are known to work with the Wiimote. I bought the Cirago BTA-3210 USB 2.0 Micro V2.0+EDR Bluetooth Dongle on TigerDirect for around $20 and it comes with the Toshiba Bluetooth drivers. I inserted the Cirago receiver into my USB port and installed the drivers from the included CD. After a reboot I opened the Bluetooth Settings windows and clicked new connection, I pressed the 1 and 2 buttons on the Wii remote to put it is discovery mode and it was recognized without a hitch. I mentioned this project to my wife early on and she ordered me several LED pens from Amazon which was very sweet of her but none of them worked. You need an IR pen with certain specifications. There are many sites with the specs on how to build one, but I just purchased one from Wiiteachers.com for around $18. 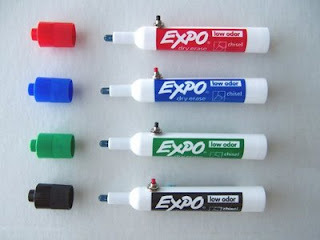 It is a standard Expo dry erase marker that they gutted and then fitted with the IR light, a switch, and place to put a single AAA battery. There are a few fancier pens out there, but this one was cheap and worked well. Once I had everything (I already had a few Wii remotes at home although the kids did complain when I took one away for work), I setup a projector connected to my laptop, connected the Wii remote via my Bluetooth receiver, ran the Wiimote Whiteboard application, calibrated the IR pen, and was using the pen as a mouse. Set the Wii Remote to the side with a clear view of the entire projected screen. The IR sensor has about a 45 degree angle and several times the calibration worked fine but it could not see the outer edges of my screen. I finally mounted (with a rubber band) the Wii remote to my camera tripod and set it over to the side of the wall I was projected on. When you use the pen you have to make sure you body is not blocking it from the IR sensor on the Wii remote. This was not too much of an issue because I had to be to the side of where I was using the pen anyway as to not cast a shadow over the projected area. If you bump the Wii remote, the projector, or resize your desktop you will need to recalibrate the pen. This is very easy to do with the Wiimote Whiteboard application. Also if you use it with a Virtual PC image, the desktop resolution on the Virtual PC needs to be the same as the host desktop or the pointer and the pen are off a bit. Once everything was working I opened up my Virtual PC with Team System 2008 and the Conchango Sprint Task Board application. The setup works great and I can easily move tasks from one state to another as well as tap on an item to get the detail pop up window. The scale slider at the top of the board allows you to zoom in and out so you can see the entire board or zoom into a specific set of User Stories. Windows comes with a virtual keyboard that you can use to type using the IR pen. This is not super optimal, but it works for small things like updating a tasks remaining hours. The Windows version is fairly rudimentary so I downloaded the freeware version of Touch-It's virtual keyboard which had some added features like docking, customizable keyboard layouts, etc. While it is still not the same as an actual physical board with note cards, for those using an Agile management tool already this is a cheap way to get close to it. Here is a short video of me setting this up and using the task board. That's looking pretty slick Tommy. WiiR seems to be definitely a good choice for the budget. But I can hardly imagine having the projector ON 10h/day and having the jalousie ON to keep acceptable darkness in the room.. as far as the team members have to be able to access/actualize the task board whenever necessary. Unfortunately, the alternative with huge FullHD resolution touch screens (that would solve the issue), is still quite expensive one. On the other hand, I can imagine the standard large non-touch FullHD LCD screen (for a fraction of price of touchie one) in combination with WiiR as a nice solution for a full time available virtual taskboard. What do you think about it? Have you seen this combination in action? sticky index cards on the wall isn't working for what reason? How about duck-taping iphones and ipod-touches to the wall for smart index cards? for an example from SNL. The Wii remote solution is really only practical for the daily stand up. I agree that another form of display for an information radiator is preferable, such as a large LCD screen or monitor. You are also correct that typing using the virtual keyboard is a pain and would not be very practical for any significant amount of data entry. I use for updating hours remaining on a task on the virtual board. For people already using a virtual task board (for whatever reason) this is a cheap solution to gain some of that tactile nature lost from using a real board with note cards and sticky notes. I also like the idea of using it with remote teams over WebEx as a type of virtual white board for design discussions. We had a small team here in Nashville and some guys in California and on that project I would use my Tablet PC often over WebEx and it really helped in design discussions. Anytime I post anything about using any type of software for Agile management it usually winds up with comments about why not to use them. I am an advocate for using physical story walls and task boards, but I have many large clients who have distributed teams and they usually require some amount of tools to help and gain some of the collaboration and interaction back. If you see no value it the virtual task board, then do not use it. I plan a lengthy post of the pros and cons of both sides since most of the posts on the subject and definitely slanted towards the purist side and I think there are many points on both sides. BTW - The link did not work, but I have seen that skit before. Let's pick up this discussion in a week after I post my blog entry on Agile tools and this time we'll use more data to back up our positions than the same guys who came up with the Bass-o-matic. Farewell eScrum, We Barely Knew Ya!